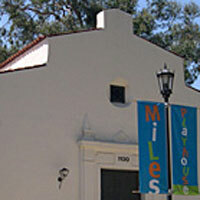 The Miles Memorial Playhouse is located at 1130 Lincoln Blvd. in Christine Emerson Reed Park (Formerly Lincoln Park). It was constructed in 1929 after former City Councilman, J. Euclid Miles and his wife Katherine bequeathed $25,000 upon his death for the construction of a public recreation hall for the young men and women of the city and dedicated it to their daughter Mary A. Miles. Designed by John Byers, an architect noted for use of the Spanish Colonial revival style, the building is a City landmark and is eligible for inclusion on the National Register of Historic Places.